This project is about a battery powered fingerprint sensor I placed just outside the door of my house. The last person leaving the house or the first entering it would use the sensor so the controller could arm/disarm the alarm but of course can be used to control anything (e.g. opening the door). Since the controller gets the id of the fingerprint when there is a match, would also know who is entering the house so greeting the person by name out loud (kind of funny :P). 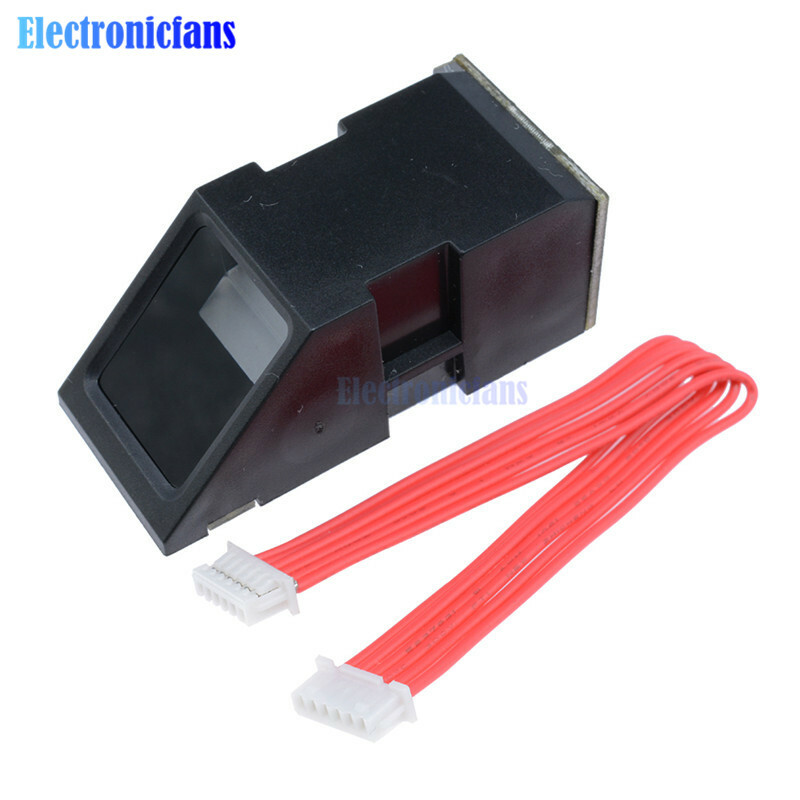 The fingerprint sensor I'm using is a FPM10A that can be found on Aliexpress for 5$ (https://www.aliexpress.com/item/Fingerprint-Reader-Sensor-Module-FPM10A-Optical-Fingerprint-Fingerprint-Module-Locks-Serial-Communication-Interface-For-Arduino/32835820214.html). Wiring is pretty simple (http://www.duino.lk/image/cache/catalog/Components/fingerprint scaner/fingerprint_sensor_6pwhs7n-500x500.jpg) , it uses a serial connection for the communication and sample code and a library is available from Adafruit (together with a Windows utility that can be used for troubleshooting and for enrolling your fingerprints). If battery powered, the sensor cannot of course stay always on since consuming around 150mAh. This is why I've attached a button to the project so the person using it can press the button, the node wakes up, the sensor turns on and the person can put the finger on it. After that, the board goes back to sleep. I've also added a buzzer to shortly beep in case of a positive match. 2: FPM10A sensor. RX and TX connected to pin 5 and 6 (using SoftwareSerial). Basically the node sleeps and wakes up every hour to report battery and signal level. When the button (attached to pin 3) is pressed, the node wakes up and the FPM10A is powered on by PowerManager (which turns HIGH pin A1 so saturating the transistor and activating the sensor). If there is a fingerprint match, then the fingerprint id is sent back to the gateway and the node goes back to sleep. Before doing so a short "bip" is sent to the buzzer. If nothing happens for 15 seconds, the node goes back to sleep regardless. for power savings i generally use load switch, p-mosfet instead bjt (like your transistor). but that depends on the circuit, voltages etc. just curious, as you're using 1Mhz clock, have you measured power consumption ? Sometimes it's not worth to use 1mhz. Is the fingerprint data stored in the sensor itself? or somewhere else? @crankycoder yes, in sensor itself. It has its own built-in micro-controller. do you know if this will work with the sparkfun library? I've just checked spurkfun's fingerprint scanner isn't compatible with adafruit's. They have different data packet formats. But it seems that FPM10A (ZFM-20) has the same format as more expensive R309 (if you happen to come across one). @crankycoder the fingerprint sensor should be able to keep track of 200+ fingerprint which have to be enrolled first (through a windows utility or an ad-hoc arduino sketch). Regarding the library in NodeManager I've integrated the Adafruit's one, the one on sparkfun seems designed for a different sensor. @monte i was just wondering if it could use the sparkfun, since you can do an enroll without saving it to the internal and have the template it generates dumped to a var. Then you can do a finger capture without having it try to identify and dump that to a var. @scalz forgot to mention, other reason why I'm using a 1Mhz bootloader is because having other nodes at 1Mhz in my network for running on batteries below 2.8v, the gateway is 1Mhz as well and I've always noticed issues when mixing 1Mhz and 8Mhz nodes with RFM69 radio. Since 2.2.0 they can at least kind of communicate but due to the different speed I guess, sometimes something gets lost. With NRF24L01 mixing looks good instead. well, here i prefer to use a faster processing gateway. no issue with slower nodes.. but i'm not using official mys branches (could be that, not sure..).